L'actor estatounitense Vincent Price, en una scena d'a cinta Laura (1944). 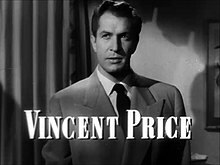 Nombre real Vincent Leonard Price, Jr.
Vincent Leonard Price, Jr., naixito de Saint Louis (Missouri) o 27 de mayo de 1911 y muerto en Los Angeles (California) o 25 d'octubre de 1993, estió un actor estatounitense, activo en o cine estatounitense dende meyatos d'os anyos 1930. Entre a suya filmografía, se i puet mencionar bellas cintas, como Tower of London (1939, Rowland V. Lee), Brigham Young (1940, Henry Hathaway), Laura (1944, Otto Preminger), The Keys of the Kingdom (1944, John M. Stahl), Dragonwyck (1946, Joseph L. Mankiewicz), The Bribe (1949, Robert Z. Leonard), House of Wax (1953, André de Toth), The Fly (1958, Kurt Neumann), House of Usher (1960, Roger Corman), Dr. Goldfoot and the Bikini Machine (1965, Norman Taurog), u The Abominable Dr. Phibes (1971, Robert Fuest). Se veigan as imáchens de Commons sobre Vincent Price. (en) Vincent Price en IMDb. (en) Vincent Price en Internet Broadway Database. (en) Vincent Price en Allmovie. (en) Vincent Price en Turner Classic Movies. (en) Vincent Price en Find A Grave. Zaguera edición d'ista pachina o 2 set 2014 a las 04:50.